Amazon now has over 100 million Prime members in the United States. That’s according to a Q4 2018 analysis of Amazon customer shopping patterns released by Consumer Intelligence Research Partners, LLC (CIRP). 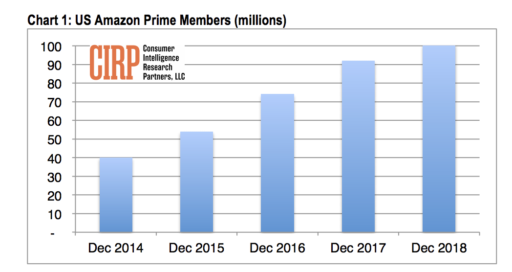 As of December 31 2018, CIRP estimates that in the US, 62% of Amazon customers are Prime members. Based on this figure, CIRP approximates that in the US, Amazon Prime now has 101m members. The report also states that in December 2018, 58% of Prime members were paying for membership annually, while 36% were paying a monthly fee. Meanwhile, 7% of Prime members have a free trial according to the analysis. “Amazon grew to over 100 million US Prime members in the quarter,” said Josh Lowitz, Partner and Co-Founder of CIRP. “Membership growth has slowed, but continued steadily in the holiday quarter. US membership grew 10% in the past year, slower than before, but still significant on a huge base and after years of rapid growth. Mike Levin, Partner and Co-Founder of CIRP added: “As Prime membership growth flattens, the nature of the membership changes somewhat. “One-third of members pay a monthly fee, and can basically leave and rejoin Prime at any time. “They do this even though the annual cost of $119 costs less than the sum of twelve monthly payments on the monthly plan, or $156. Added Levin: “These more transient members obviously don’t have the same commitment to Amazon shopping and the suite of Prime member services. Amazon Music officially launched in Mexico in November 2018.